I want to tell a personal story. An incident happened to me in all of one moment and shook me to the core. It made me laugh at my stupidity and also handed me a valuable lesson. Oh and a story to tell the grandkids some day. The story is set in the Mission neighborhood of San Francisco, in a parking garage. A map of the exact location in Mission is needed here. 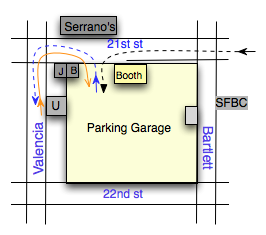 J, B, U, Serrano’s and SFBC are locations on the streets as marked around the parking garage in question. J and U are food establishments that I have frequented quite often in the past year that I have been in San Francisco. My route on such occasions from home via car is the orange arrow from Valencia on the left into the parking garage. A couple of months ago, I enrolled in a weekly evening course at SFBC (on Bartlett, on the RHS of the map above). I would come straight from work using the route marked by the black directed line on 21st from right. I would cross Bartlett and turn left into the parking garage. I would park my car in the garage, walk over to the door (unlabeled gray box directly opposite SFBC) and go into SFBC. After the 2 hour class, I would walk back to the garage, pay the parking attendant at the booth the parking fees and exit out the garage the way the blue arrows go in the map above: out and left on to 21st facing Serrano’s, and then left on to Valencia to go to home. I went for 6 weeks to SFBC for my course. The course finished. Then a few days later, I again went to Serrano’s (via the same orange route) and parked my car in the garage as usual. And there, in one moment, it was as if a bolt of lightning had hit me. I was left thoroughly shaken. I realized at that moment that this is actually the same parking garage that I used when coming in for my SFBC class. My brain raced to think about how it was when I used to come for the class. I then realized that I had often marveled how the parking attendant looked somewhat familiar and how once or twice I had felt that I “knew” the pizza place called Serrano’s when exiting the garage after the class. Whoa! How stupid could I have been? To top it all, it was a meditation class in SFBC that would usually leave me quite calm and awake so I was definitely not in an unalert state around my class. Granted that I am still new to SF, but what happened? Why did my brain not realize it earlier? It is astonishing to me that I could not conclude this simple fact even at those times when I “felt” after the class that I had somehow seen the parking attendant before. Equally astonishing is the simple but powerful life lesson embedded in this episode: the crucial value of perspective. Isn’t it amazing how the same thing can look completely different depending on how you are looking at it. In my case a parking garage looked like two different garages for no good reason. You look at a thing slightly differently, perhaps at a different time of day or in a different frame of mind and an apple could look like an orange. Isn’t that incredible? A simple lesson in the wisdom of practising tolerance of other points of view. I am definitely passing this story to my grandchildren!